SAN ANTONIO - The GoVote No campaign, which opposes the fire union-backed charter amendments on the Nov. 6 ballot, released new, leaked recordings on Tuesday of fire union president Chris Steele speaking with firefighters. In the six clips sent to members of the media, Steele is heard denouncing Mayor Ron Nirenberg, quoting incorrect statistics about the city's crime rate and detailing the union's strategy to get city officials to act in the union's favor. The snippets most critical to Steele are his jabs at Nirenberg and the plan he said the fire union has devised to secure a new collective bargaining agreement, which has been at an impasse for years. "Remember I told you there were three tactical objectives: That’s to get Ron (Nirenberg) to negotiate, but if (he) doesn’t, that’s to get Greg Brockhouse to run against him and knock him out in May of 2019," Steele is heard telling firefighters. "And we’ll get a contract right after that. So, you know, I’m not promising anything, I’m telling you this is the plan." Steele's plans to get District 6 Councilman Greg Brockhouse in the mayor's seat in the next mayoral election were revealed in the first recording released by the GoVoteNo campaign earlier this month. The union responded to the release of the tapes Tuesday, saying they were "just another attempt by the No campaign to deflect discussion away from the issues." While the GoVoteNo campaign argues the new recordings point to Steele's "obsession with politics over public interest," the San Antonio Professional Firefighters Association said its primary goal is to get San Antonians more transparency from city leaders. "We want an end to backroom deals, an end to constantly rising taxes and utility rates, and an end to putting special interests ahead of the public interests," the union said in a news release. It's unclear what "backroom" deals the union is referring to in its statement. Nirenberg responded to the recordings Tuesday, saying they were evidence the propositions are not about the people of San Antonio as the fire union claims they are. Nirenberg went on to call Steele the "real enemy" of the people. In one of the newly released recordings, Steele is also heard detailing his refusal to enter into negotiations with the city. "So, the city has asked me nine times to come to the table," Steele says. "I said no. But if we go to the table, 60 days is all you have to negotiate by law. Once you’re there 60 days you file impasse. Impasse says, 'I can’t work with the city,' and so then, the city has to agree to an arbitrator." What do the charter amendments say and what will happen if they are approved? The City of San Antonio has provided the ballot language on their website, and what happens if they are approved. Shall the City Charter be amended to expand the types of ordinances that may be subject to referendum including appropriation of money, levying a tax, granting a franchise, fixing public utility rates, zoning and rezoning of property; increase the number of days within which a petition may be filed seeking a referendum on an ordinance passed by council from forty to one hundred eighty days after passage of the ordinance; and to provide that no more than twenty thousand signatures of registered voters are required for a referendum petition instead of ten percent of those electors qualified to vote at the last regular municipal election? Shall the City Charter be amended to limit the term the City Manager may serve to no longer than eight years, limit the compensation of the City Manager to no more than ten times the annual salary furnished to the lowest paid full-time city employee, and to require a supermajority vote to appoint the City Manager? Shall the City Charter be amended to provide the International Association of Fire Fighters Local 624 with unilateral authority to require the City to participate in binding arbitration of all issues in dispute with the Association within forty-five days of the City’s receipt of the Association’s written arbitration request? 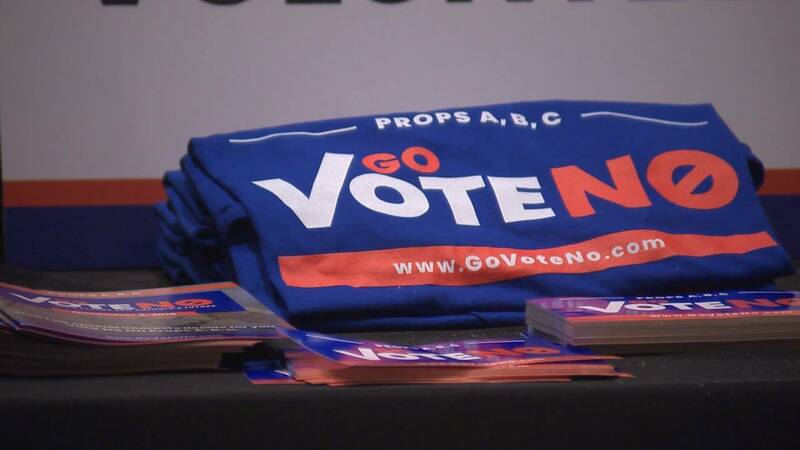 Proposition A: Expanding the Referendum Process. Lengthen the time frame for obtaining the needed signatures from 40 days to 180 days. This measure subjects fiscal actions, such as tax rates, utility rates and bond issues, to the referendum process limiting the ability of the City Council to consider and implement policy and to manage the budget. The uncertainty created by potential changes to revenues and expenditures would certainly negatively impact the City’s AAA bond rating. The amendment creates uncertainty resulting in cost to the City of San Antonio between $382.3 million and $4.2 billion over the next twenty years. In addition, it would create uncertainty in the area of economic development because companies looking to relocate to San Antonio and expand their operations through the use of economic development incentives may want not to face the potential uncertainty of referendums and will decide to go to another city. Based on the average size of the corporate relocation or expansion in San Antonio, this could result in a loss of 202 jobs per project. Proposition B: Term Limits and Salary Cap for City Manager. This measure requires a supermajority vote (8 votes out of 11) to select the City Manager, limits the City Manager’s term to 8 years and limits pay to 10 times the amount of the lowest paid City employee. Currently, the City Charter gives City Council the power to determine compensation on the basis of his/her executive and administrative qualifications. The City Manager is hired by and serves at the pleasure of the City Council. Arbitrarily limiting tenure and salary restricts the ability of the City Council to recruit and retain the best talent for the position. This measure could limit the City's ability to attract the top-level talent necessary to efficiently and effectively run a city of this size. This may lead to a reduction in the quality and quantity of public services that, combined with the uncertainty created by the other two amendments, could slow economic growth. For example, firms looking to relocate to San Antonio or expand their operations within the city may decide not to do so out of concern that the infrastructure, quality of life and other public services may not meet their needs. This measure would not impact the current contract of the City Manager. Proposition C: Binding Arbitration. This measure allows the firefighters union to unilaterally declare impasse at any time and force binding arbitration on the City in labor contract negotiations.